Evangelicalism, an inter-denominational religious movement that has grown to become one of the most pervasive expressions of world Christianity in the early twenty-first century, had its origins in the religious revivals led by George Whitefield, John Wesley and Jonathan Edwards in the middle decades of the eighteenth century. With its stress on the Bible, the cross of Christ, conversion and the urgency of mission, it quickly spread throughout the Atlantic world and then became a global phenomenon. Over the past three decades evangelicalism has become the focus of considerable historical research. 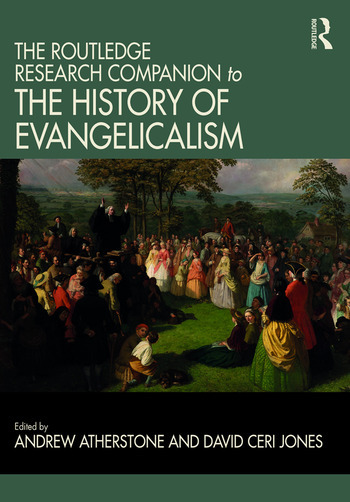 This research companion brings together a team of leading scholars writing broad-ranging chapters on key themes in the history of evangelicalism. It provides an authoritative and state-of-the-art review of current scholarship, and maps the territory for future research. Primary attention is paid to English-speaking evangelicalism, but the volume is transnational in its scope. Arranged thematically, chapters assess evangelicalism and the Bible, the atonement, spirituality, revivals and revivalism, worldwide mission in the Atlantic North and the Global South, eschatology, race, gender, culture and the arts, money and business, interactions with Roman Catholicism, Eastern Christianity, and Islam, and globalization. It demonstrates evangelicalism’s multiple and contested identities in different ages and contexts. The historical and thematic approach of this research companion makes it an invaluable resource for scholars and students alike worldwide. Andrew Atherstone is Latimer Research Fellow at Wycliffe Hall, Oxford. He is author of Archbishop Justin Welby: Risk-taker and Reconciler (2014) and co-editor of Evangelicalism and the Church of England in the Twentieth Century (2014). David Ceri Jones is Reader in Welsh and Atlantic History and Head of the Department of History and Welsh History at Aberystwyth University. He is co-editor of George Whitefield: Life, Context, and Legacy (2016), and Evangelicalism and Fundamentalism in the United Kingdom in the Twentieth Century (2013).